for "Sheridan Celebrates" in 1999. This page updated: February 2, 2009 with photo credit. November 19, 1998, saw Fort Logan Elementary welcome back many former students. A grand tour of the building, a video and refreshments, and discussions among the guests rounded out the evening. Principal Judy Kary, welcomed the guests with a talk about the school from its early years to current times. Fort Logan was originally a school district, serving a much larger area than today. Children of farmers and workers associated with the Fort were served. They walked to school or were brought by their families. Farm fields were to the east of the current building as show in old photos. An irrigation ditch filled in the 1970s ran just east of the school and separated the playing field from the building. The oldest part of the school was built in 1923. The cornerstone was dedicated on July 3, 1923. Fort Logan (pictured of left, view from southeast) was built to replace a school building that had stood on the grounds before. The 1923 structure has two stories, the classrooms being on the second floor. Grades 1st and 2nd were taught in one room, 3rd and 4th were in one, 5th and 6th in one, and in the last 7th and 8th grades. Each grade had 9 to 11 students. The lower rooms were mechanical and the kitchen. A number of the guests present remember the old structure, having attended classes there. By 1931 each grade consisted of 20 to 25 students and were in separated classrooms, by the 1950s some grade levels had five classrooms. The offices and three classrooms were added, the work being done by men who lived in the surrounding areas. 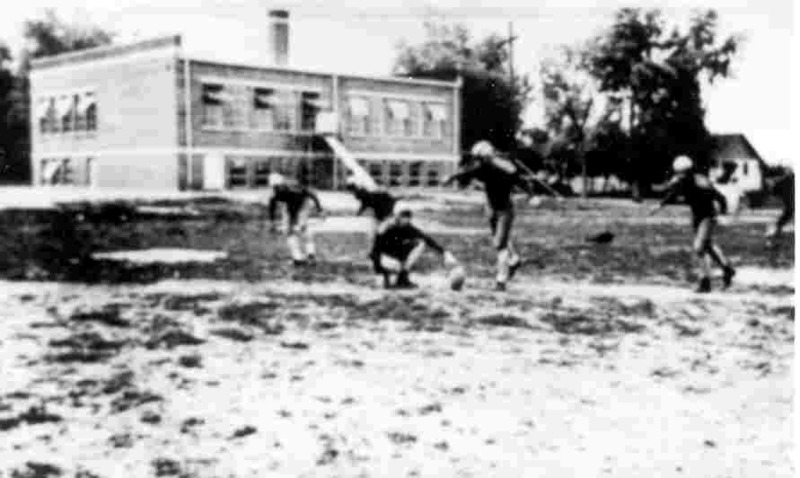 The gymnasium was added in 1940-1941 when the U.S. Army built the gymnasium so that military personnel would have a recreation center. The first eighth grade graduation in the gym took place in 1941. At the end of the graduation ceremony in 1947 the school principal, Miss Alice Bodine was married and became Mrs. Alice Terry. Alice Bodine Terry was loved by the community. She was the science teacher and Principal at Fort Logan during the 1930s and 1940s. She would often take students to the store and buy them shoes or clothes. She made arrangements with the local bus and cab companies to take the students to intramural sports activities with other schools and paid for this transportation herself. She was a harsh disciplinarian, but the students respected her and knew that she cared about them. She later became Superintendent of Schools in 1960 - 1961. The Fort Logan school community changed from fields and dairy cows to homes after World War II as much development occurred in the community. Local elementary schools College View, Fort Logan, and Petersburg combined to form the Sheridan Union High School so their students would no longer have to attend Englewood, Littleton, or South High after completing the eighth grade. Later they would lose College View to an annexation by Denver. The schools are now all Sheridan School District #2. The school was enlarged 1947 with the addition of four barracks bought from Fort Logan grounds and bricked over to make eight additional classrooms. Parents and community members did most of the work. In 1952 another addition which included five rooms was added followed by two more in 1956. The large cafeteria was also added in 1957. Four modular classrooms were added in 1968. With the construction of the new high school in 1972, the old high school became a middle school and all the elementary schools now end at the fifth grade. Currently the school has eighteen classrooms, four modular classrooms, a three room library, a computer lab, and two small rooms for small group instruction. Work continues with improved heating, plumbing, electrical system upgrade, carpet and acoustical ceilings. A bond issue allowed further updates in 1989. Former students remembered the dress codes and the discipline procedures from their school days at Fort Logan. Until the 1960s the code was very strict. Boys had to were belts every day, no hair could tough the collars of their shirts. Girls had to wear skirts that came to or below the knees. Female teachers were expected to wear dresses and male teachers wore suits and ties. The teachers' word then was absolute. If a teacher said something was to be done, the students did it without questions. Talking back was not allowed. Students who fought or cursed were involved in serious misbehavior could count on having a belt or paddle used to help them conform to good behavior. Many of those attending the celebration brought photos to share and their graduation diploma. The artifacts are available upon request at the school. 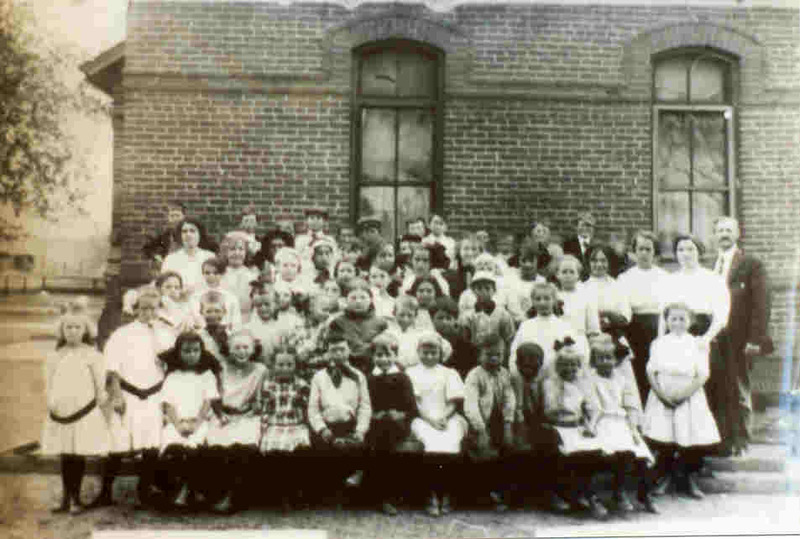 Picture: Students and staff of Fort Logan School, May 19th 1913; photo by C. Bronzelio.